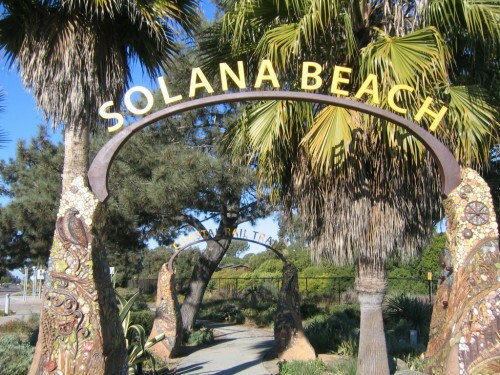 Solana Beach California is approximately a 30 minute drive from downtown San Diego. Its a charming seaside community and is home to a vibrant train station that serves both Amtrak and the Coaster, one of only three in San Diego County. Cedros Design District is just a short walk from the beach and features over 85 restaurants and one-of-a-kind shops.Its fun to go gallery-hopping along Cedros Avenue! A local hot spot for live music is the Belly Up Tavern. Fletcher Cove - is the main beach park in the city of Solana Beach. It is also commonly know as "Pillbox" because of its history as a WWII Gunnery installation. Parking is seldom a problem for visitors traveling by car because there is a parking lot as well as free street parking. There is public access that leads to the beach with lots of activities including body boarding, surfing, surf-fishing, walking, swimming and jogging. There is a basketball court located on top of the bluffs next to the Marine Safety Department Headquarters, as well as picnic tables. Restrooms, showers and a lifeguard is on duty year round. Tide Beach Park - is about 1/2 mile north of Fletcher Cove and parking is limited to free street parking only. This park has showers but there are no public restrooms and lifeguards are on duty in the summer months only. The beach itself is mostly known for its large reef and its beautiful tide pools. Seascape Surf - is about 1/2 mile south of Fletcher Cove. Its known to many surfers as Cherry Hill. There are showers but no restrooms. Parking is free street parking and a lot across the street from the beach access. The wide sandy beach is excellent for most all beach activities. Del Mar Shores - is located at Solana Beaches southern boarder and is about 3/4 miles from Fletcher Cove. Beach access is provided via a public stairway and there are no showers or restrooms. Free street parking as well as 3 free small parking lots. This beach park provides excellent recreational opportunities as well as a scenic viewpoint.